The most popular massive multiplayer online types – ACC Interactive Media Arts Student Blog! With the changes in the internet some people who like to play video games may want to play with lots of other people who share similar interest as them. For some people when they think of massive multiplayer online(MMO) games their mind think of the massive World of Warcraft, and there is no surprise to that because of the millions of people who still to this day are playing. But there is more than just the mmorpg where the camera is a top down and you control by the mouse. There is also ones where you can control the character in a first person or third person with the arrow keys are the main control, example of these are Elder Scrolls Online where you have the choice between the two views. This entry was posted in General, Interactive Technologies, Media Trends & Tech and tagged gaming, multiplayer, technology. 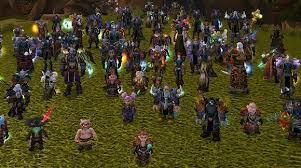 Thanks for the Blog, you Brought me up to speed on what MMO means, i play MMO’s all the time!! i just didn’t know that it was called that! I think that you make a great point! There are a few spelling mistakes that i noticed,, and I would have liked to have some automatic links that i could have clicked on so that i could have went straight to the website. I like how you went into detail about the game and the comparison to real life! made me want to play the game!